New kicks are the key to pulling off an intentionally polished look—thanks in part to the rise of athleisure, which has spilled over from the studio and into nearly every other aspect of our lives. No longer relegated to your commute or the weekend, when styled right, a fresh pair of sneakers (not the ones in the back of your closet or in the trunk of your car) is a stylish and comfortable option for everyday wear. Keep reading to get style tips on how to integrate sneakers into your everyday look. Keep reading to see our new favorite sneakers! Lace-ups are the only sneakers invited to formal and chill events alike. Pristine canvas lace-up sneakers paired with jeans and a blazer are perfect for when you want to look effortlessly put together. For an even sleeker look, go full-on athleisure with a patterned pencil skirt and structured top. Casual, yet versatile—slip-on sneakers are an easy, fun choice to wear with a knit dress and leather coat on the town to meet friends for game night at your favorite neighborhood bar. During the week, choose comfort, and pair them with a button-down and slacks for a PTA meeting. We love to color block with white leather sneakers and a bright-colored pleated midi and blouse for carefree weekend activities. Or, if you’re headed to the office, a well-tailored, feminine suit is a wise step in the right direction. There are so many options to style casual footwear for everyday wear. 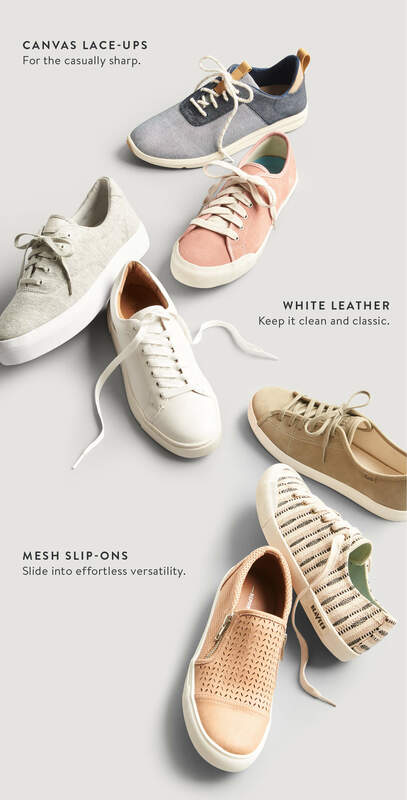 Ask your Stylist to choose sneakers you’ll love to sport in your next Fix.